Attached here are details of the CCCBR AGM to be held this September in London. This is our first meeting since the CRAG proposals were voted on and approved. You will see there is much more on offer than at past CCCBR weekends. In addition the meeting is not just for CCCBR representatives but ringers in general. I look forward to you seeing you there. To be held before the GUILD AGM. INTER-TOWER 6 and 8 BELL – Saturday 18th May in the Portsmouth District. Planned to be morning competitions – details to follow shortly. If your tower has not entered the Tower competition before please don’t be shy. It’s great fun, a great opportunity to meet other Guild members and caters for a wide level of expertise – and you never know – you may come away with the cup! Details for all competitions will be posted in the near future. Convener – Striking Competition Committee. 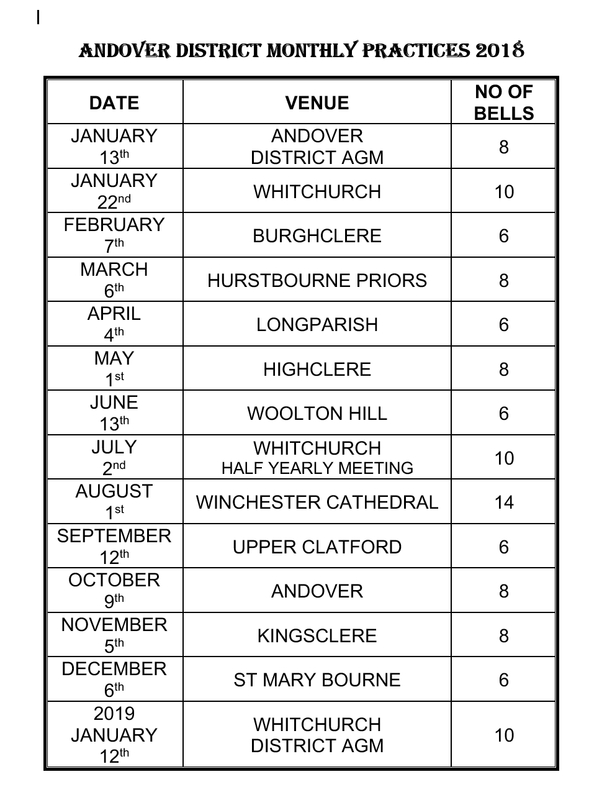 A PDF of the Christchurch & Southampton District Events in 2019 can be downloaded from here. The Portsmouth District committee has now issued the calendar for 2019, which can be downloaded in pdf form for printing or, if you wish to embed the Google Calendar in your electronic calendar system, please click the “plus” symbol at the bottom of the calendar window on this page and follow the instructions. Throughout the year, the calendar is subject to slight changes so it is useful to have the up to date version to hand. Some time ago in a news letter, there was mention of reviving the Christchurch & Southampton Quarter Peal Club in 2019, led by Polly Osborne. We are still putting feelers out for local (to New Forest area who can accommodate on Fridays), and lighter ring 8 bell towers, whilst Brockenhurst undergoes repairs from the roof collapse. The Quarter Peal Club will still run on a Friday, as this seemed best for members in general. In the interim, if you would like to become a member of the group, please drop me an email, so we can add you to the email list for future developments. Members are already showing interest in attending the Cathedral services in 2019. These two occasions will offer special opportunities for us all to join fellow ringers to give our thanks for the sacrifices made by the countless victims of the WW1 conflict and to honour their memory. Please encourage all members to note these dates in their diaries. Winchester Cathedral – Sunday, 19th May 2019 – 3.30 p.m.
Portsmouth Cathedral – Sunday, 12th May 2019 – 6 p.m.
Heritage Open Days 2018 will be 6-9 & 13-16 September. Welcome to our first e-alert for organisers -we’re delighted to declare that registration is now OPEN! So who will be first to sign up their event this year? We can’t wait to hear what new stories and sites you have to share. Everything you need for registration is in the Organiser Area. You can access this through the website with your login. Your username will be your email address, and if you’ve forgotten your password there’s a link to reset it on the login page. Image upload and previewer – so you can see how pictures will appear on the directory. As this is a new system, any images uploaded in previous years will need to be added again. Extra description field for short summaries. Following your feedback, this added feature will help co-ordinators who print leaflets and visitors and media who want a quick, print-friendly list of what’s happening. Deadlines: 1 May – full promotional support; 1 August – final deadline. Remember the sooner you register the more support we can offer you – particularly for press coverage. We start publishing entries on the web-directory from mid-July. Taken part before? Then you can simply update and re-submit the details of your previous entry. You’ll find them in the Archive section of My Events in the Organiser Area. Registration tips: We’ve given our Organiser Area a lick of paint this year, including a streamlined registration form. For an overview of the process see our registration tips with a handy flowchart for reference. Do let us know of any issues – or anything that works particularly well, your feedback really helps us help you. Take action! Login to the Organiser area now to register. You can print off pre-completed registration forms to send out to individual sites from the My Events section. You can download handy documents in the Useful stuff section including a template letter to encourage private home owners to open. We’re working on new material to encourage involvement, but for now you can download copies of the existing ‘Get Involved‘ leaflet from the website. You can see who else was involved last year, and who is registering this year by using the searches in the HODs Communitysection. Extraordinary Women – Our main theme for 2018 celebrates the multitude of women who have touched lives on every scale, and left a legacy that should be cherished but has perhaps been overlooked. Find out more about uncovering and sharing their stories here. As an organiser we will send you short alerts about the registration cycle for the festival but if you’d like the wider news, then sign up for our newsletter. It’s just launched so sign up today to be among the first to receive it! You have received this email as a participant of Heritage Open Days. If you are no longer involved in the programme just let us knowand we will remove your contact details from the database. Saturday 10th March, Plain Hunting on 7 and 8, and to Triples and Major methods, at Petersfield. Saturday 14th April, Calling touches of Doubles and Triples, to Plain Bob, Grandsire and Stedman at Liss. All these will take place from 5.30-7.30pm. I have more requests for future practises for various other methods and will hold up on arranging any more until we see how well the first 3 go. Sorry for ant repetition in these emails, I just want to make it clear to everyone what will be happening and where. Thanks to those who made it to the surprise royal practice this afternoon in Southampton. Kristian informs me it was a useful practice so thanks again to all who made it. Thanks again for supporting these practices. Please note that these events are held on the Winchester District Calendar. 1300 – 1600 BROWNSEA ISLAND – 3 hours on the island – café for refreshments on island, games (indoor if wet, outdoor if fine), free time, (possible educational tour (if time)) and ring at BROWNSEA (8) for 45 minutes, say 1400 to 1445 (exact ringing time to be confirmed). 1645 Arrive back POOLE Quay – half hour free time for afternoon refreshments at Poole Quay – leave POOLE at 1715. This year’s Essex Ringing Course runs from Thursday 6th to Saturday 8th April. The closing date for applications is Friday 10th February. GROUP A — Improving foundation skills. Have you reached the stage in your early ringing career where even if you understand the theory of what you are meant to be doing you are finding doing it an entirely different matter? If so this group is for you. Students in this group will work on their individual ringing skills so that they can improve their bell control, listening and ropesight. This may require time working alone on a bell as an individual with the advice of your tutor, as well as ringing with other ringers. Students will also practise raising and lowering a single bell. A Group for those who can ring Rounds competently and who are ready to take their first steps in call changes and then, possibly, in change ringing on 3 or 4 bells. If you are in any way doubtful about joining Group C, then join Group B; you will still find something to learn and will have the opportunity to fill in steps in your ringing education you may have missed or not appreciated. A Group for those wishing to plain hunt on 5. The opportunity to practise on different rings of bells and in different orders both on the treble and “inside” will be provided. The Group will emphasise the skills required for change ringing and will be learning ropesight and considering striking, as an essential preliminary to ringing the treble. Practice may be given at ringing the treble to Bastow, Minimus and Doubles, to “Stedman Quick Sixes” and to Plain Bob Minimus as appropriate, before progressing to ringing the treble to Plain Bob Doubles. A Group for those who really have ropesight and bell control and are ready to ring the treble to Grandsire Doubles and Plain Bob Minor. It is intended to progress to ringing the treble to touches in both these methods. A number of other methods may be rung to practise the different rhythm of change ringing with six bells. A Group for those who are competent in ringing skills as outlined in the above groups and wishing to learn Plain Bob Doubles on an “inside” bell. A Group for those who are already competent in ringing skills as outlined in the above groups and able to ring touches of Plain Bob Doubles and who wish to learn Plain Bob Minor “inside”. You should be able to treble hunt reliably to touches of Bob Minor before applying for this group; if in any doubt consider applying for Group D.
Starting with Doubles and progressing to Triples with calls. Applicants must be proficient in ringing the treble to Grandsire and be able to ring touches of Bob Doubles “inside” to get the full benefit from this option. Would you like more variety on Practice Night? Explore Reverse Canterbury, St Simon’s and other methods or variations which contain a number of different ‘works’ which will be useful in your future ringing career. The Group will study and practise several Plain Minor methods (Single / Double Court and Oxford) which introduce many of the building blocks and concepts needed before progressing to Surprise. Methods such as St Clements and Little Bob may also be included. Applicants must be able to ring touches of Plain Bob Minor on an inside bell competently. Starting with Doubles and progressing to Triples with calls and theory on extension to Caters and Cinques. You should be proficient in ringing up to Group G to get full benefit from this option. To get the full benefit from this group applicants must be able to ring Plain Bob Major “inside”, be able to ‘treble bob’ proficiently and have some experience of Treble Bob or Surprise Minor. The Group will start with Cambridge Major and move on to Yorkshire. This Group will start with calling Plain Bob and Grandsire Doubles, and progress to Plain Bob and possibly other Minor methods. Students will be actively involved in calling a variety of touches, and will be expected to ring whilst others of the Group are calling. No previous experience of calling is required, but you must be able to ring touches of Grandsire Doubles and Plain Bob Minor “inside” competently. Because of the popularity of the subject the Education Committee is arranging another evening for Basic Raising and Lowering Skills. This will be at Bishopstoke on Friday 9th June. Full details with poster and application form will be sent out nearer the time. Is your Ringing Chamber a “hidden place”? How regularly do non-ringers come and visit? The Heritage Open Days provide a ready-made publicity machine for us if we decide to open up our towers to the public, and an opportunity to showcase our fantastic hobby. If you are looking for new recruits then participating in this kind of initiative can help to get you onto the map in your locality. The Heritage Open Days site is here if you want to browse. The list of Hampshire towers which advertised events on their site in 2016 is here. ART Conference in March is open to everyone and all are warmly invited. Open to everyone and incredibly good value for money the ART Conference is packed full of inspirational speakers and learning opportunities. Don’t miss out on the Inspirational speakers sharing their knowledge and experiences in leadership, recruiting, teaching and ‘igniting the spark’ in learners. Many will have filled in the Central Council’s questionnaires and CRAG’s Philip Barnes will be there to give an update on ‘The story so far’. The Award Ceremony in the evening will recognise people who have excelled in their contributions to the bellringing community. And that is just Saturday! On Sunday we have a rare opportunity to learn about and further our knowledge on hand bells and Pip Penney will be hosting a Mentoring Workshop. And don’t forget that your £12 for Saturday INCLUDES a cold buffet lunch and Sunday’s £10 ticket includes tea, coffee, cake and a light lunch! The PR Matters day is just over 6 weeks away, and we still have places. The day is looking very good, with a number of experts in PR coming to share their thoughts on the subject, specifically in relation to change ringing, as well as dedicated time to share thoughts and debate how our PR can be more effective. Pre-reading is currently being finalised to share with participants to get the ball rolling, and we already have a really mixed attendee list – with people who are new to a PR role and want to learn more, to those who have worked professionally in the PR world and want to share their learnings with fellow bell ringers, to those simply interested in the subject and who care about the future of change ringing. We also already have representatives from more than one continent! Senior officers of ringing associations might find the day particularly valuable. So, if you would like to meet other ringers and spend a stimulating day working together to come up with ideas and actions which will potentially positively impact the future of ringing – whether by increasing our recruit rate, getting more funding for projects, or ensuring that the level of ‘complaints’ is kept low – then do please sign up. If we get a spread of representation attending the day, then the diversity of thought being shared will be greater, and when going back out and implementing any agreed actions it will be much more powerful than if isolated to certain geographies only. Breaking News! ART Conference 2017 tickets have gone on sale. 2017 will see Winchester and Portsmouth Guild hosting the ART Conference including the second ART Awards ceremony at Basing in the Basingstoke District. The ART Conference is once again presenting a packed agenda of speakers sharing best practice from their ringing as well as ideas from other activities and professions. The Conference is ART’s leading national event and is open to anyone with an interest in ringing teaching and leadership. We would like to invite you to join us at Old Basing, Hampshire on 11th March 2017 for what is sure to be a full and interesting day. The day includes talks by two headline speakers, and a range of afternoon sessions to choose from. A number of new ART products will be launched and stalls will be available all day long long selling a range of publications and the latest equipment. The ART Awards Ceremony will be accompanied by drinks and nibbles. On Sunday 12th March, you will be able to attend one or two ART workshops. Choose from “Learning Handbells”, “Mentoring Workshop” and “Teaching Handbells”. Tickets are only £10 including lunch. Ringing Culture: Help or Hindrance?